I don’t often cook on Saturdays because they always turn out to be busy in a way or another, either because Renata and I have a lot going on – especially in the summer, when a lot of our time is taken by outdoor concerts, film festivals and outings to picnics or the beach. There is also the fact that there is always something going on when the weekend comes, even in the dead of winter when it feels too cold to do anything but cuddle under the covers, open a bottle of red wine and enjoy a good movie on DVD. But when we do happen to be in, I like to make more of a snack-oriented dish that can be prepared quickly and enjoyed in the same manner – without a fuss, no special equipment or anything like that. One example is the often-mentioned zapiekanka, a Polish snack made with mushrooms, cheese and a generous helping of ketchup (I pretty much lived on those during our 2010 trip to that country), and black bean burgers have also become a staple of sorts at home. Another favorite is a recipe I discovered on my very first issue of the sorely missed Gourmet that was originally published in 1945 and reprinted in 2001 for what I believe was its 60th anniversary celebration, in which they went through the different culinary trends of the many years of that legendary magazine’s existence. According to the original article, “Pasta wasn’t always the carbohydrate vehicle of choice — in the ’40s, lots of saucy things were spooned onto toast. “ The preparation couldn’t have been simpler: sauté the mushrooms, make a roux, mix them together and spoon them over toast coated with ham or turkey breast. I must say that I sorely miss Gourmet. Over the decade that I subscribed to I ( I still have every single issue I received – I would say about 300 of them – in a large box stored in a closet) , I learned a lot about the art of cooking, such as properly dressing salad, cooking pasta , wine pairing, using spirits in recipes. I was really distraught when Gourmet suddenly bowed out in 2009. Sure, Bon Appétit is still out there (and I am a current subscriber) but It is really a poor substitute for the culinary expertise that the pioneer publication was able to pass on to its faithful readers. Arrange bread slices on a baking sheet and spread with 2 tablespoons butter. Toast in middle of oven until golden, about 10 minutes. Heat 1 1/2 tablespoons butter in a 12-inch heavy skillet over moderately high heat until foam subsides, and then sauté mushrooms in 2 batches until liquid from mushrooms is evaporated and mushrooms are browned, 6 to 8 minutes, adding 1 1/2 tablespoons butter for second batch. Transfer as cooked to a plate with a slotted spoon. 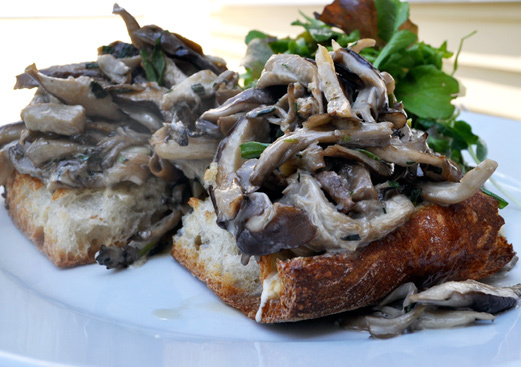 Arrange a slice of ham on each toast and top with mushrooms and sauce.